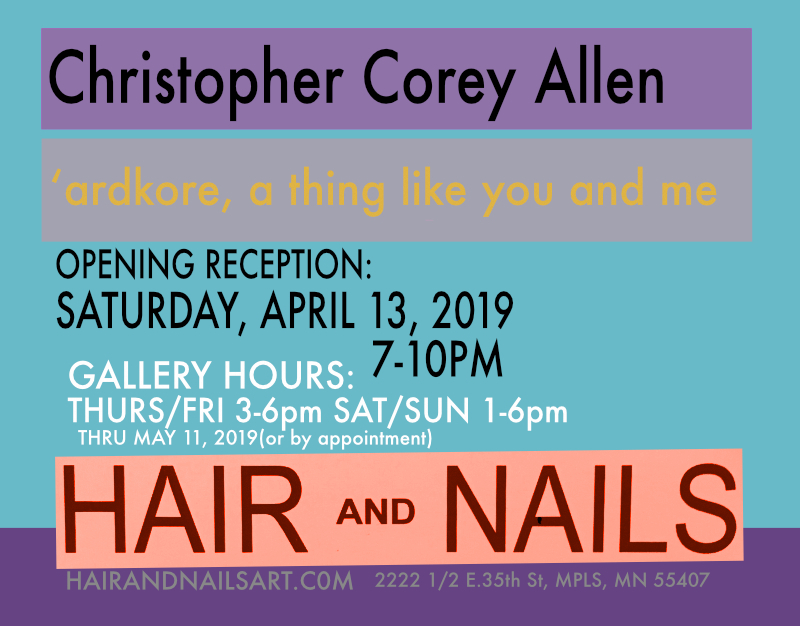 Allen has twice been artist-in-residence at HAIR+NAILS, turning the storefront into a green screen video set in the off-season. Allen’s 2017 residency hatched the video/sculpture/print show “MERE BELLIES”. CCA received their MFA from Cranbrook Academy of Art and BA from the University of Minnesota. They are a 2018 Tobey Devin Lewis Fellow and have been the recipient of numerous awards including the New Beginnings Award from Mercedes-Benz Financial Services, the Lenore G. Tawney Foundation Award, the Artist Initiative grant from the Minnesota State Arts Board, and the Arts Learning Grant from the Metropolitan Regional Arts Council. Residencies include Mass MoCA, North Adams, MA, Frans Masereel Centrum, Kasterlee, Belgium, and Pino, Florence Italy. Exhibitions include Walker Art Center, The White Page Gallery, and Soap Factory, Minneapolis MN, the Minnesota History Center, St. Paul, MN, Roman Susan Gallery and Wedge Projects, Chicago IL, Cranbrook Museum of Art, Bloomfield Hills, MI, and DAM, Detroit, MI.